suspense books as a retired detective. me first. If I believed it, I could make it believable on the page. preparing for war with France. his death. She would be alone in the alien medieval world. like a detective does looking for anything I might’ve missed. 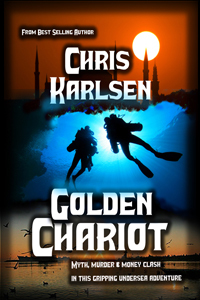 Chariot and Byzantine Gold, are from a different series. They’re romantic thrillers. enough of the foreign legal process to make the investigation relatively accurate. due process to create a great deal of fear in her. came in handy but not as a result of my personal experience but with who I knew. from both the police department and the military when I was writing Golden Chariot. am incredibly grateful for his patience and assistance. involving a sniper type attack. inserted a code word for terrorist. My father was a history professor and my mother was, and is, a voracious reader. I decided to pursue that dream. rescue dogs and a rescue horse. 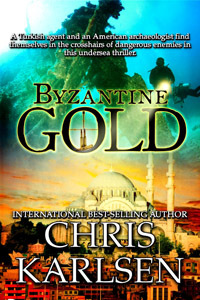 the series Golden Chariot and Byzantine Gold are from. for the Turkish Ministry of Culture. work and I start asking for reviews as soon as I can. take care of the costs. say they felt part of the setting from the narrative description. (if you mean another author) it would be either Bernard Cornwell or John Sandford. grocery clerk and a police officer. and the thriller aspect has wider appeal. 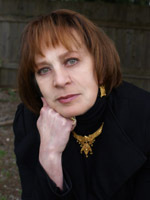 books, Julia Quinn’s historical romances along with Julie Anne Long and Deanna Raybourn. I also like Stephen Coonts’ thrillers. Nook, tablet for emails, and my iPod with my music. A couple of changes of clothes. the sidewalk cafes at night. Driving around England and Scotland is a fave. I love it there. I love there’s so much history and castles, and picturesque villages, and nice people. I can never see all I want in a visit. I’m always ready for a glass of champagne. When I’m alone, I listen to music and read. at parties where I don’t know many people.